HomeCommentaryHistory in the making: Is Europe shifting allegiance to Russia? A country in the heart of Europe openly defies its partners by aligning with Putin. While European leaders were considering the possibility of imposing additional sanctions against Russia, Austria has rolled out the red carpet Tuesday for…Russian President Vladimir Putin. In addition, the Austrian energy company OMV has also signed an agreement with the Russian gas company Gazprom to confirm its participation in the construction of a gas pipeline, the South Stream. The 2,446 kilometers long pipeline would provide this country in the heart of Europe, Russian gas, bypassing Ukraine, plagued by serious political unrest for several months. 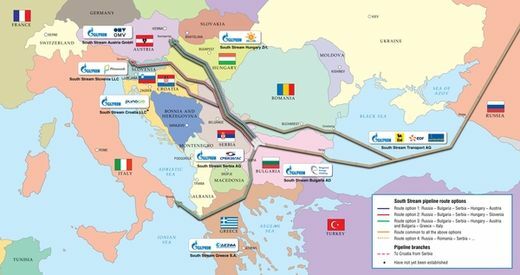 Its route crosses the Black Sea south of the Crimea and Bulgaria, Serbia, Hungary and Slovenia, to arrive at Baumgarten, Austria (see map below), where the gas will be dispatched to their client states in central Europe, including Germany. The project is valued at 40 billion dollars (30 billion euros), of which EURO 200 million of the portion is located in Austria, both signatory companies have decided to share the costs. It will “diversify energy supply” from Russia. Currently, two-thirds of Russian gas transits through Ukraine, which makes deliveries vulnerable to potential disruptions. This is the first time since 1968 that a Western European country concluded an agreement for a long-term gas provision with Moscow. However, the European Commission argues that the South Stream project is not in conformity with the European Community law because the pipeline does not provide third-party access. In addition, the agreement is contrary to the EU strategy to reduce its dependence on Russian gas. From this point of view,the agreement signed in Austria is a real blow to the EU. “Barely a month after Putin signed the Holy Grail agreement with Beijing (a contract to supply $400 billion in gas between China and Russia, concluded last month), he not only managed to formalize its conquest of the European market with yet another pipeline –and one that completely avoids the Ukraine- but it also marked another major political victory by creating a cleavage at the heart of the euro zone, after Austria openly defied partners by siding with Putin,” writes Zero Hedge. In politics, the question is who has the power, and who submits. 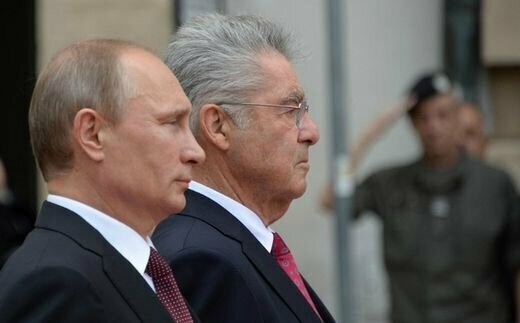 Austria has submitted itself today, and by defecting from its European partners, the nation may have started a process that could lead to the collapse of the euro zone itself, with anyone other than Vladimir Putin pulling the strings once more. Austria is not the only country to support the South Stream project. According to EurActiv, the Italian Minister Matteo Renzi Pemier also argues in favor of this pipeline to the EU on behalf of all EU countries it crosses.